Corned beef briskets are available in most supermarkets all year long. If you've seen this inexpensive beef cut before but were hesitant to purchase it because you weren't sure how to cook it, you'll be really glad that you found these recipes. Corned beef is a great-tasting, budget-friendly meat dish that is simple to prepare. It's also quite versatile - once you've cooked a corned beef brisket, there are several tasty dishes you can make with any leftovers you might have. There's no easier way to cook corned beef than in a slow cooker. Place all ingredients in your slow cooker, being sure to include the seasoning packet that comes with the corned beef brisket. Cook on low setting for eight to ten hours. Corned beef and cabbage: Cut a small head of cabbage into wedges and add it to the slow cooker at the beginning of the cooking process. Keep some liquid when serving. Corned beef stew: Cut 4 large potatoes, 1 onion and 2 carrots into chunks; add to the slow cooker at the beginning of the cooking process. You can also include cabbage, if desired. Keep some liquid when serving. 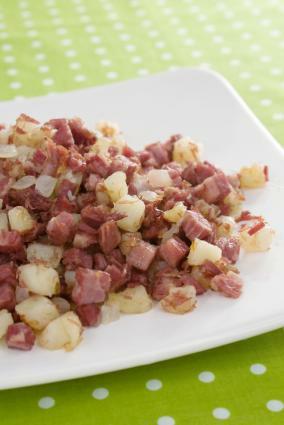 Corned beef hash is a favorite dish for breakfast, lunch or dinner. It's super-easy to prepare if you have leftover corned beef on hand. Add diced, cooked corned beef. Cook for 15 minutes more. 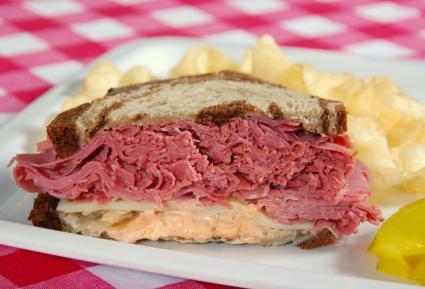 Reubens are tasty, popular sandwiches. Whether you cook a corned beef brisket just so you can make Reuben sandwiches or if you are looking for something to do with leftover prepared meat, this sandwich is sure to be a hit. Spread Thousand Island salad dressing on two slices of rye bread. Place slices of corned beef on one slice of bread. Close the sandwich with the second slice of bread. 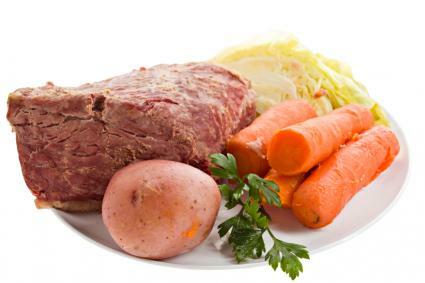 Corned beef recipes evolved from a specific process to preserve meat. In the days before refrigeration, some meat was smoked or dried, some was brined in a mixture of water, salt, and spices, and some was rubbed with a dry mixture of salt and spices. The brisket of beef, a fairly cheap cut, could be preserved using any of these techniques. Since the large grains of salt used in the brining and dry-curing processes were referred to as "corns" (the word "corn" in this context is an old-fashioned term to describe something that comes in large grains), beef preserved by these two methods came to be called "corned beef". These days, it is most common to see beef cured in brine rather than with a dry rub, and although fine salt is used more often than larger salt grains, the name "corned beef" has persisted.